Ready in just minutes and this is one of those dinner recipes that’s great for when you want a spicy hit of sweet chilli but still want to keep things fairly healthy. 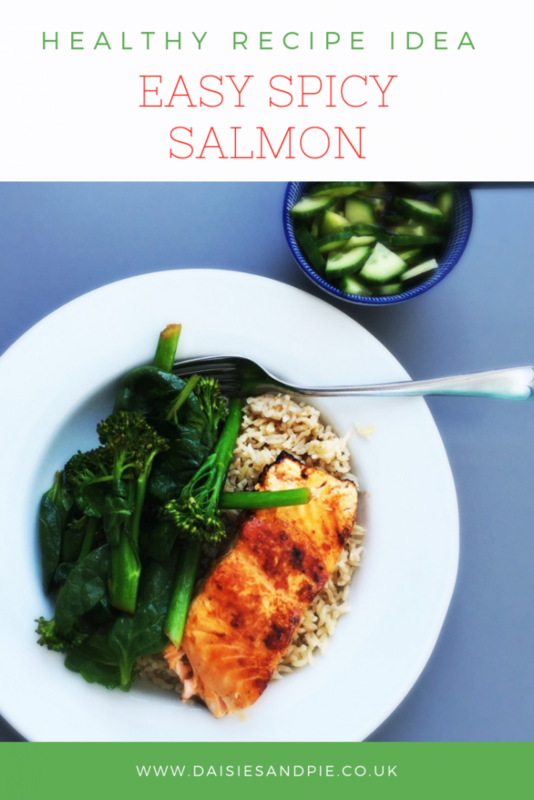 To keep things fast we serve up the spicy salmon with quick stir fried greens and a side of wholegrain rice – the microwave pouches – ready in like 2 minutes! We also add a little side of cucumber pickles because they just taste so good and only take a moment to make. To perfectly cook the spicy salmon fillets to they taste amazing you need to be sure you sear them in butter or oil in a hot pan always cook skin side down first – you want that skin lovely and crispy. As the salmon fillet cooks it will start to change colour going from a bright pink to a softer paler pink colour. Once the colour change is around 3/4 of the way through the salmon fillet then it’s time to flip the salmon over carefully and continue to cook on the other side. Quick and easy fish recipe that's great for cooking when you're short on time. Put the salmon fillets into a plastic bag, add the sweet chilli sauce and toss gently to coat them. Add a splash of sesame oil to a small frying pan and place the salmon in skin side down over a medium heat, leave to cook until the skin sizzles and crisps, then turn over and cook the other side - depending on how thick the fillets are they should only take 5-8 minutes to cook though. Whilst the salmon cooks, heat a splash of oil in a wok and gently stir fry the ginger, spring onions and broccoli. Whilst the dinner cooks make up the cucumber pickles by putting the cucumber into a small bowl, pouring over the vinegar and adding a splash of soy sauce. Stir gently to coat everything. When the broccoli is starting to become tender, add the lime juice and spinach to the pan and turn off the heat so that the spinach just wilts in the pan. Microwave the rice - this usually takes 2 minutes. To serve divide the rice between two plates, top with the salmon fillet, add the stir fried greens and help yourself to cucumber pickles. Can I use a different type of fish for this recipe? Of course – this recipe works really well with cod fillets or king prawns – just adjust the cooking times to suit. How can I switch up the sweet chilli salmon recipe differently? Add radish to the cucumber pickles. Serve with noodles instead of rice. No time to prep – pick up a bag of stir fry veggies and use Lazy Ginger from a jar instead. What to serve with spicy salmon? skip the stir fried greens and go for a big bowl of salad instead.